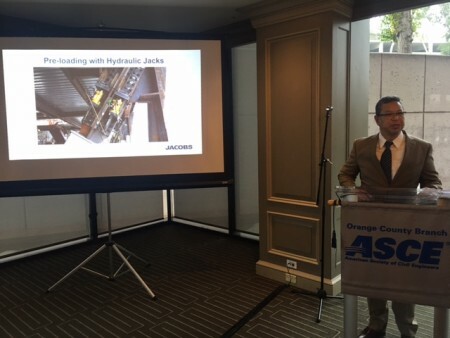 ASCE Orange County held the December luncheon at the Center Club in Costa Mesa with a presentation by Raul Rasco, P.E., the Jacobs construction management representative for the Wilshire Grand Redevelopment Project. The $1 billion hotel and office complex being developed by Korean Air, is about 85 percent completed, with a projected Substantial Completion date in Spring 2017. The Wilshire Grand Hotel is located at a prime location in downtown Los Angeles at 900 Wilshire Boulevard. 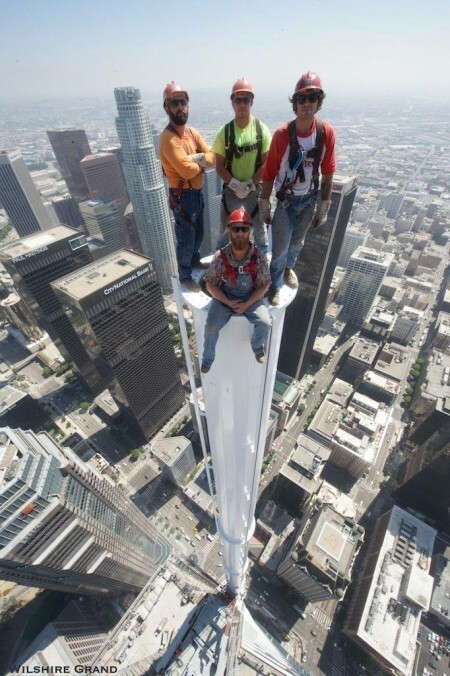 The structure is 73 stories tall and encompasses 2.1 million square feet. The Tower features 16 stories of office space, 889 hotel rooms, 7 levels of amenities, and 5 levels of below grade parking. The project is being managed, designed, and constructed by a strong team of professionals, including Martin Project Management, A.C. Martin Partners, Brandow & Johnston Structural Engineers, Thornton Tomasetti, and Turner Construction Company. 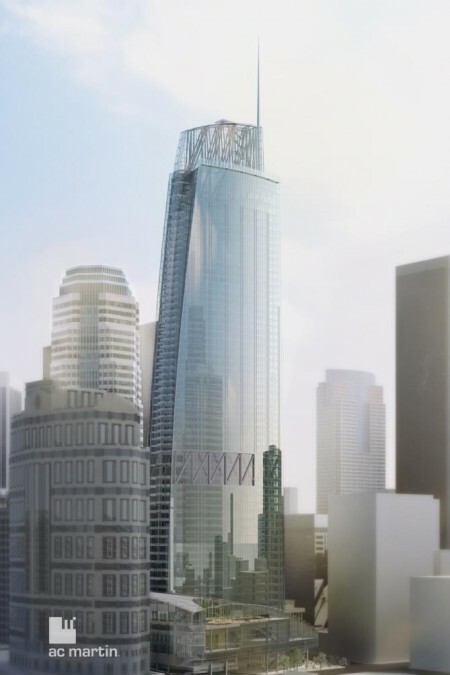 This new addition to the LA skyline features double decker high-speed elevators that lead to the hotel lobby on the 70th floor. This lobby is referred to as the “sky lobby,” showcasing remarkable views of the city. The building also has a sky deck on the 73rd floor with a dining and entertainment area that complements the LA night life. The Tower provides easy pedestrian access to downtown, local and regional transit systems. Due to tight site constraints, the existing hotel structure was deconstructed down to individual pieces. This deconstruction began in January 2013 and was completed in six months. 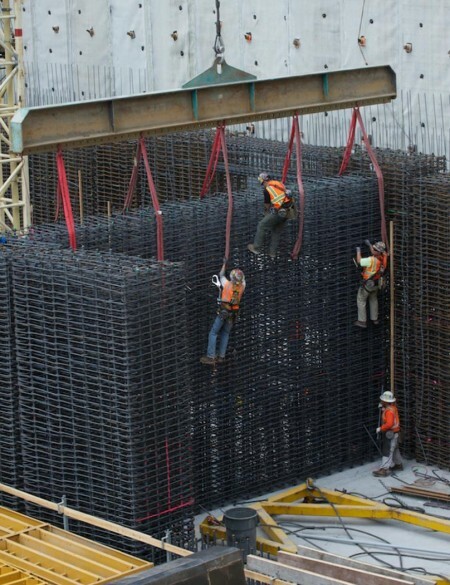 In February 2014, this project broke the Guinness World Record for the largest continuous concrete placement of 21,200 cubic yards in 18.5 hours. To prepare for this long pour, proper thermal control measures were implemented to limit maximum temperatures and temperature differential to prevent thermal cracking and long-term concrete deterioration. Following the foundation, the reinforced concrete core of the tower began to be constructed. At the base of the building, this consisted of four foot thick concrete walls. This work was executed through the use of a hydraulic formwork system from EFCO. Following the concrete core, the structural steel was erected to complete the structural frame. 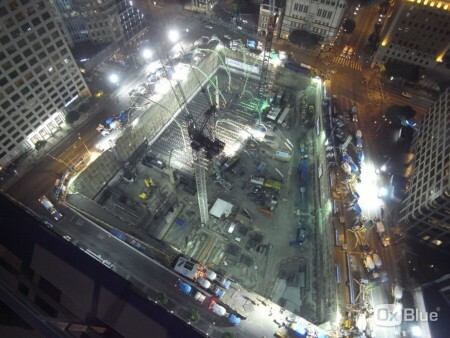 The structural steel was sourced from the United States and South Korea, and erected on site using four tower cranes. Because there are 29 major active faults between .2 and 46 miles of the project site, the seismic integrity of the building was the primary focus during the design phase. With the performance objective to stay linear in ‘elastic limit,’ the Service Level Design EQ (SLDE) included a 475 year return period for moderate earthquakes. The building is braced with BRBs (buckling-restrained braces), which are specialty structural brace elements that consist of an axial force-resisting steel core encased by a system that prevents buckling of the steel core. The design accounts for long term effects and axial displacements due to sequential loading phases during construction. The Upper BRBs brace and span the three topmost stories of the building. 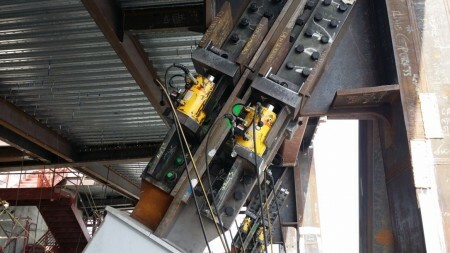 To accommodate differential movements due to elastic shortening, shrinkage, and creep and to prevent the tensile stresses that would occur on the BRBs from settlement, hydraulic jacks pre-compressed the Upper BRBs. This is intended to prevent permanent deformation after 50 years of creep and shrinkage.